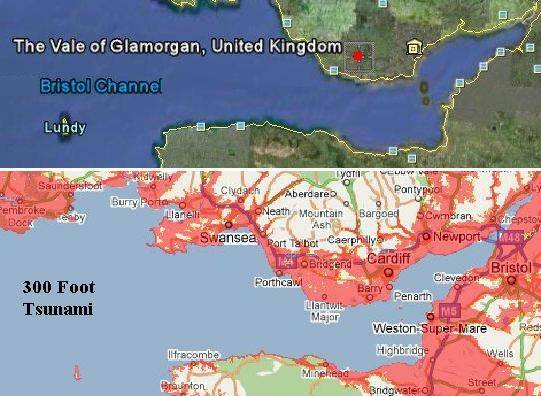 The Bristol Channel will experience tidal bore during the European tsunami. This fact is the reason our estimate for the water height to strike the UK coast was from 200-300 feet. Why this variance, unless there were factors that would affect the water height. Tidal bore occurs when the water has an increasingly more narrow path before it, and thus must rise to accommodate the press of water coming behind it. A bore does not stop until the height of the water pushes back onto the oncoming water with an equal force. Momentum of the oncoming water also is a factor. The European tsunami will be a lot of water, coming at great force and speed. For those who want specifics on just which river bottom or ravine will experience a bore, we suggest seeking the advice of a hydrologist. Models of the terrain can be built, and subjected to water force in a lab pool, for instance. Nancy and ourselves will not have time to address every nitch in the UK. For those who cannot arrange for this analysis, assume the worst case situation, 300 feet in height, and utilize the free Google Maps facility to determine if you are in the red or in the clear.